When three parents - Lisa (Leslie Mann), Mitchell (John Cena) and Hunter (Ike Barinholtz) stumble upon their daughters’ pact to lose their virginity at prom, they launch a covert one-night operation to stop the teens from sealing the deal. 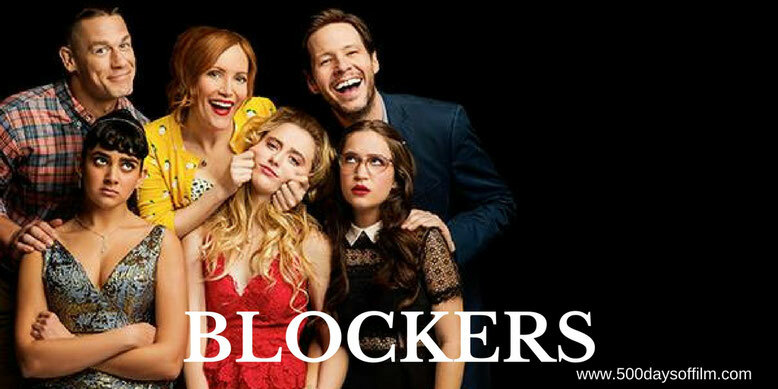 After the surprisingly hilarious Game Night, I was happy to read positive reviews for Kay Cannon’s directorial debut, Blockers. It was, these reviews stated, a movie that was - shock -actually funny. Two effective comedies within a couple of months? Are we looking at the start of a comedy resurgence? While the jury is out on this wider question, Blockers certainly has a lot going for it. Leslie Mann gives the film’s stand out performance. She is brilliant as Lisa - displaying wonderful physical comedy (particularly in a hotel room scene). I also enjoyed Ike Barinholtz’s Hunter and it is good to see John Cena take a leading role. As much as I enjoyed the friendship between these three misguided parents, I also appreciated the fact that, in this tale of parent/child role reversal, the teenage kids were actually pretty smart. Kathryn Newton, Geraldine Indira Viswanathan and Gideon Adlan all portray young women who are far from your typical “comedy” teens. As a result, their prom night journey feels less irritating and more endearing. However, while Blockers is entertaining with a consistent smattering of laughs, it just isn’t funny enough to fully satisfy. The film relies too heavily on gross out humour - a device that has never worked for me. A good effort but Blockers isn't in the same league as Game Night. I have now seen far too much of Gary Cole. If you have, what did you think of this film? Let me know in the comments section below or via Twitter (you can find me @500DaysOfFilm).